Not a whole lot of new product that I’m looking forward to today, which makes writing this up a bit easier since I was just handed an assignment that's due by the end of the day. Hopefully this post will be up sometime before that. The end of the day, I mean. Anyway, I do have a really interesting factoid that I learned at work that I'd like to share with you guys, so that's something at least. Did you know that the playwright Samuel Beckett used to drive Andre the Giant to school when he was a kid? I...didn’t know that. But when I learned about it, my head nearly exploded. Beckett is my favorite playwright (Waiting for Godot is my favorite play), and Andre is everyone's favorite person. So the thought of those two driving to school every morning is pretty awesome. Apparently, they were neighbors, and Beckett was good friends with Andre's dad. Now, on to the comics. Or, should I say, comic. From Vertigo, today sees the first issue of Fairest ship. A spin-off of the incredible Fables ongoing series, Fairest is written by Bill Willingham (creator of Fables) and drawn by the excellent Phil Jimenez. 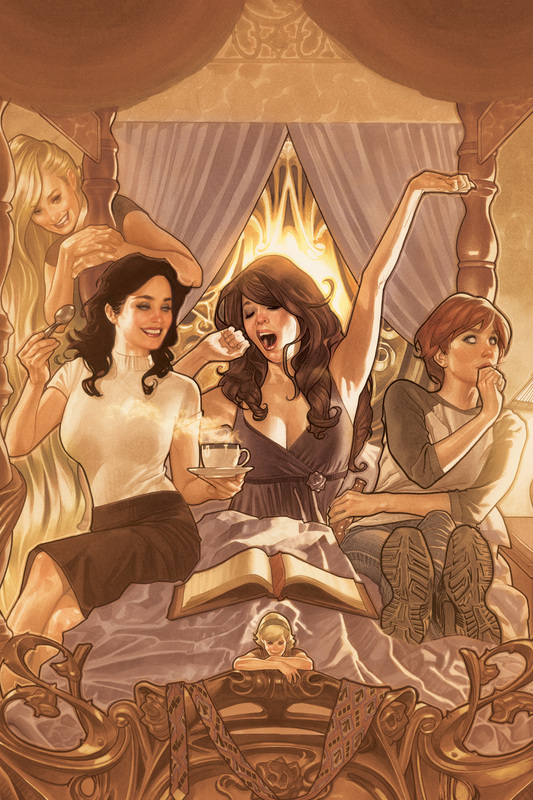 Covers are by the incomparable Adam Hughes. I'm reading Fables in trades, and I'm about halfway through the series at the moment. Still, I'm on board for this new series, as I have been constantly blown away at how good Willingham is. New York Times best-selling, award-winning creator Bill Willingham presents a new series starring the female FABLES. 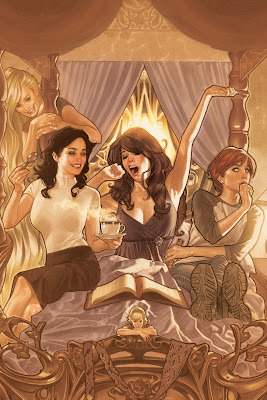 Balancing horror, humor and adventure, FAIREST explores the secret histories of Sleeping Beauty, Rapunzel, Cinderella, The Snow Queen, Thumbelina, Snow White, Rose Red and others.The first 6 issue arc follows the misadventures of Briar Rose after she is stolen away by the goblin army in FABLES #107. Fan-favorite artist Phil Jimenez (WONDER WOMAN, THE INVISIBLES) returns to Vertigo to pencil the opening storyline. Award-winning cover artist Adam Hughes (WONDER WOMAN, BATGIRL) provides covers, starting with a wraparound cover on issue #1.Future arcs will be written by 2011 Arthur C. Clarke winner Lauren Beukes with art by Inaki Miranda, and iZOMBIE scribe Chris Roberson with art by Shawn McManus! And remember: They may be beautiful, but there will be blood. It sounds great, and it's definitely something I think will be right up my alley. Hopefully I'll have a chance to go to the comic shop at some point (this week) to pick it up. Trucking onward, Exfanders. Trucking onward. Also, what are you Waiting for?